In the last month, several reviews of The Mormon Jesus have appeared. 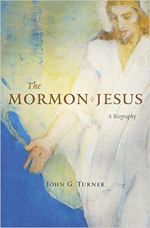 “The Mormon Jesus” is an example of excellent Mormon scholarship that can be found from authors outside the faith. Turner’s devotion to his subject and his passion for LDS people and history are strong. If you are contemplating buying the book, rest assured, it’s for you! For more reaction to the book, see these posts at By Common Consent and the Juvenile Instructor.